Navigating the murky waters of social media for property marketers can be daunting, especially when the market is extremely competitive and audiences are becoming more aware of the tactics marketers are using. But, there are still some tactics savvy marketers are using to garner tangible results for their property by using social channels. Property marketers are already implementing well-considered branding strategies, content marketing and digital marketing campaigns with success – however, social media can be the key for marketers to cut through the noise of a competitive property market and make an impact with potential purchasers. 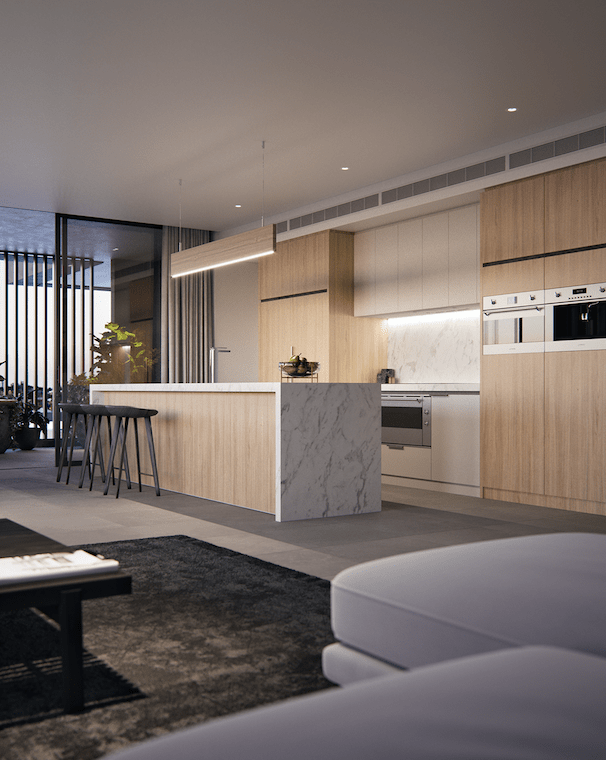 By implementing innovative strategies on social media – often centred around your project’s visuals and 3D renders – property marketers can create a community that engages and interacts with the brand’s content on social media. This genuine and dynamic interaction is what will ultimately result in the most results (i.e. increased leads or sales) for a property or new development. At Blank Canvas, we have experimented with a number of social media campaigns that have produced great results. 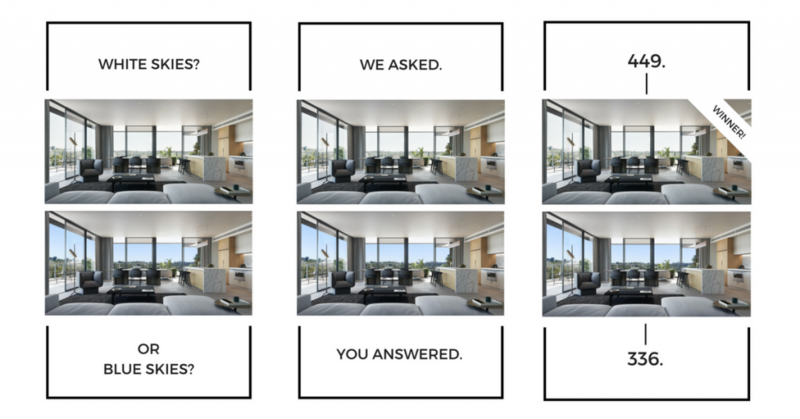 Here are some of our most successful examples of how we’ve used property renders to help our business win on social media. By marketing a property you are putting forward the idea of a lifestyle and a home, not just somewhere to live. Capturing this promise of space rather than product can be challenging in a single photo or brief caption. Vignette images are images that show a little slice of life within a building or living space. 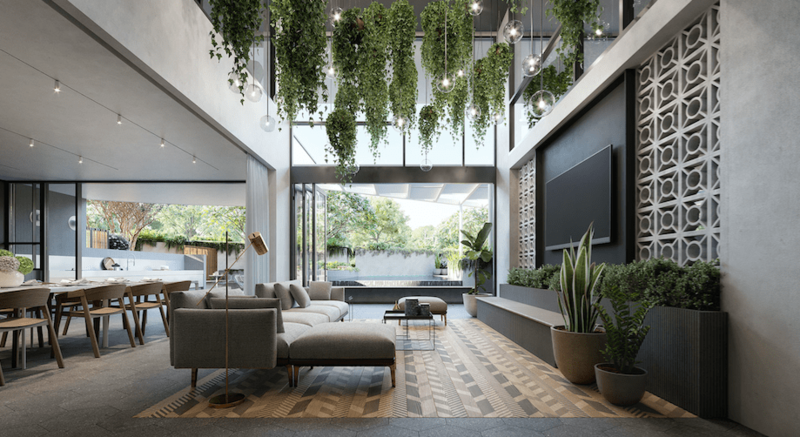 They have become a trend among property developers who are trying to focus on the story behind a development – instead of just attempting to sell the property. This trend departs from the more traditional idea of trying to display an entire room, building or property in order to show the potential client everything that is on offer. By limiting the view or perspective the images are naturally more styled and eye-catching, as well as being the perfect piece of content for a social media feed. Vignette images are ideal for both image updates and property advertisements. They aim to show more of your personality to the viewer and communicate the pillars of your brand by using interesting and non-traditional angles that differ from normal property development photography. 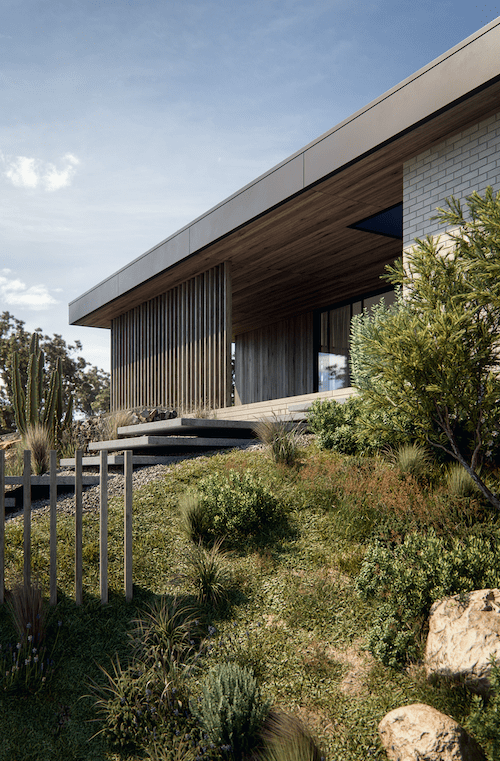 They have also proven popular with a range of industry professionals including developers, architects and 3D artists. Vignettes can be altered to suit a variety of social platforms and aim to illustrate inviting scenes that will appeal to a wider audience outside of prospective home buyers. Their purpose is to take full advantage of the public nature of social media and how people interact and engage with dynamic or attractive content. Vignette images are also suitable for traditional marketing materials such as brochures, online ads and emails. 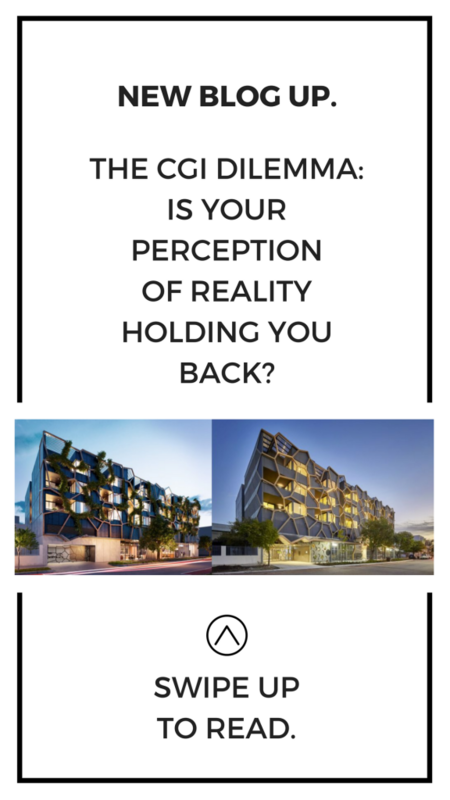 This not only creates a broader visibility for the property developer, but also a more genuine strategy for attracting potential clients to your company’s purpose. Social media platforms are designed to be fast moving and visually stimulating – that means content that is eye catching and brief is the most successful on social media. There are currently over 8 billion videos or 100 million hours of videos being watched on Facebook every day (according to Social Media Today, 2017), making videos is the most popular form of content on social platforms. Social media users love video content and tools that are able to tell a story faster than pictures or words can, which is especially important when it comes to property marketing and selling the idea of a lifestyle. Audiences who are on the move or consuming content on mobile devices are much more likely to watch a two-minute video than to read a blog post, that’s why it is imperative for property marketers to think about how they can incorporate video into their social media campaigns to ensure the best results. One successful video tactic is the use of mini animations – short videos of 3D animation that explore a building or property. These animations can be used for updates and advertisements on all social media platforms, but are most successful when used on Facebook, Instagram and YouTube. We recently employed a mini animation via Facebook that reached 50,056 people and led to 10,563 new followers with a budget of under $200 per month. 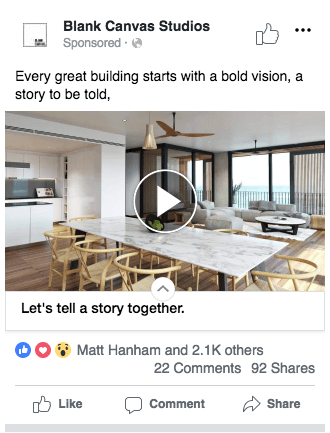 That’s the impact that video can have on a property marketing campaign when used correctly on the right social channels. One of the most relevant social media tools for property marketers is Instagram, but there’s one particular feature of Instagram that is exceptionally valuable for developers: Instagram Stories. Instagram Stories are live or uploaded video or images that lasts 24 hours and can be viewed by anyone who has access to your profile. They are short but content-rich tools that can make a very popular addition to your profile. Rather than choosing one image at a time, why not give your potential purchasers and followers fresh real-time content that can include interactive elements such as live polls, ‘swipe up’ features that link to an online sales page or lead capture form and short videos that showcase a property? Share a live video to connect with your followers in real time. Once a live video has ended you can still share a replay of it to your story. When adding content to your story, tap Live at the bottom of the screen and then Start Live Video – you will be able to see the number of viewers you have and in return they are able to add comments to your videos. If your Instagram account is linked to your Facebook account you can start creating a story and simultaneously share it to your live Facebook story. If you want to direct your viewers to more of your website or advertising content, you can add a link to your story that will show viewers a ‘see more’ button at the bottom of their screen. They can then follow this link and view your content within the Instagram app. If you have over 10,000 followers, you can include a link on any Instagram story. Accounts with fewer than 10,000 followers can include links on paid Instagram Story ads only. If you have struck gold with a particular piece of content, it doesn’t have to disappear. Stories that you create and share on Instagram are automatically saved to your Stories Archive. From here you can add a story to your highlights, which is pinned to the bar below your profile picture and visible to the public. Instagram stories are a highly effective way for developers to announce a new launch or generate interest in a new project. They allow you to draw your audience’s attention to a particular subject or event using your best imagery and video content. The best part? You don’t have to pay for a full-screen promotion that is delivered directly to your audience’s phone. When marketing a property in today’s competitive real estate industry, it’s important to remain ahead of the competition by using innovative social media tactics. Your 3D renders and project imagery can be used to help tell the story behind your development and gain an engaged following that will help push your sales even higher.